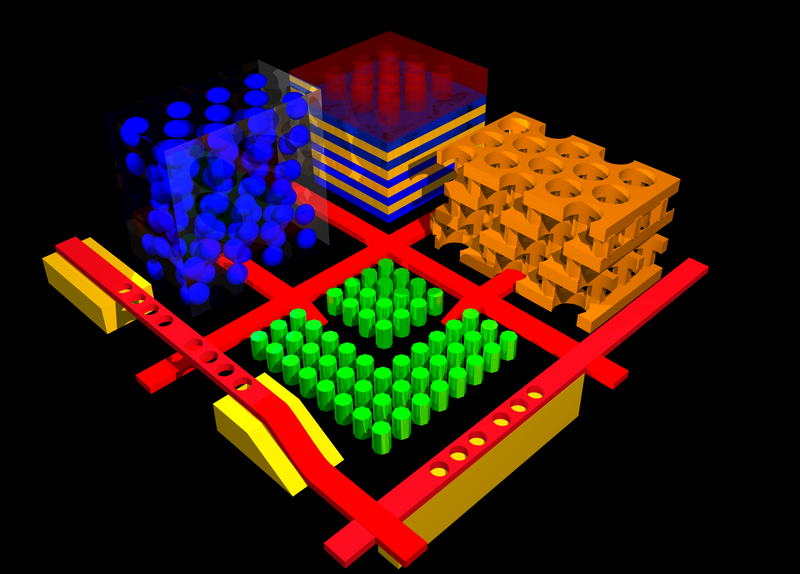 The picture above depicts a "photonic micropolis," a rather fanciful collage of many different photonic crystal devices. Rather than trying to ascribe any collective meaning to this assemblage, we will just describe the different components that can be seen in the picture. The "buildings" (tall box-like structures) are three-dimensional photonic crystals (or, more properly, three-dimensionally periodic photonic crystals with full band gaps). The golden buildings show the structure our that group has proposed for fabrication at sub-micron length scales, described in more detail on our 3d crystals page. The clear buildings with the blue balls depict a metallodielectric structure, formed by embedding metal balls into glass in a diamond lattice. Metallodielectric crystals are designed for microwave light, so it is somewhat deceptive to show them on the same length scale as structures intended for optical and infrared wavelengths. The red "roads" with holes in them are one-dimensionally periodic crystals. Both air bridges and guides resting on low-dielectric "monorails" are visible. 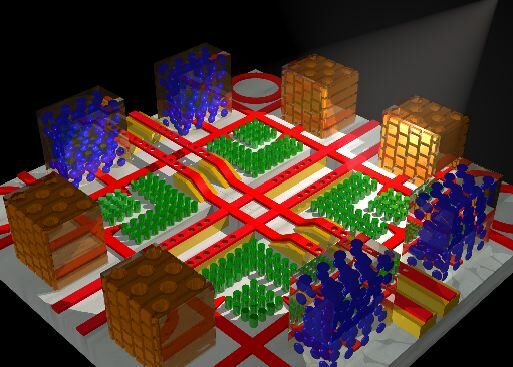 The green "forests" show two-dimensionally periodic photonic crystals (in this case, a square lattice of rods), in which a right-angle waveguide bend has been fashioned. (This works in two dimensions, but you have to use a somewhat more complicated structure to guide light in three dimensions.) The entrances to the waveguides in these crystals are formed by tapering the red dielectric waveguides--in our simulations, this was the best way to achieve good coupling, although we've subsequently developed superior taper designs. Finally, in the micropolis corners you can see ring resonators, which are a conventional (non photonic-crystal) way to achieve a resonant cavity for use in channel-drop filters, etcetera. They are still in use today because they are well-understood and easy to fabricate, but have a number of disadvantages compared to devices based on photonic crystals.